1. The carbon and nitrogen isotope composition of plants are known to be affected by environmental factors, especially water availability. While d13C of C4 plants is generally assumed to be much less responsive to environmental variables than that of C3 plants, it is unclear whether the response of d15N differs between the two photosynthetic pathways. 2. 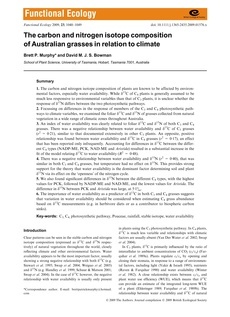 Focussing on differences in the response of members of the C3 and C4 photosynthetic pathways to climate variables, we examined the foliar d13C and d15N of grasses collected from natural vegetation in a wide range of climatic zones throughout Australia. 3. An index of water availability was clearly related to foliar d13C and d15N of both C3 and C4 grasses. There was a negative relationship between water availability and d13C of C3 grasses (r2 = 0�), similar to that documented extensively in other C3 plants. An opposite, positive relationship was found between water availability and d13C in C4 grasses (r2 = 0�), an effect that has been reported only infrequently. Accounting for differences in d13C between the different C4 types (NADP-ME, PCK, NAD-ME and Aristida) resulted in a substantial increase in the fit of the model relating d13C to water availability (R2 = 0�). 4. There was a negative relationship between water availability and d15N (r2 = 0�), that was similar in both C3 and C4 grasses, but temperature had no effect on d15N. This provides strong support for the theory that water availability is the dominant factor determining soil and plant d15N via its effect on the 憃penness� of the nitrogen cycle. 5. We also found significant differences in d15N between the different C4 types, with the highest values for PCK, followed by NADP-ME and NAD-ME, and the lowest values for Aristida. The difference in d15N between PCK and Aristida was large, at 5�. 6. The importance of water availability as a predictor of d13C in both C3 and C4 grasses suggests that variation in water availability should be considered when estimating C4 grass abundance based on d13C measurements (e.g. in herbivore diets or as a contributor to biospheric carbon sinks).